Once again, the Chetek-Weyerhaeuser Area School District ranked as one of the highest-scoring districts in the region after receiving a rating of "Significantly Exceeds Expectations" on the state report card scores. This is the first time that the District has earned this score, improving upon already high marks in previous years. The report cards were just released for the 2017-2018 school year. As part of Wisconsin’s push to a statewide accountability system for school districts, the Wisconsin Department of Public Instruction has released school report cards for all schools in the state. Each school earns a "score," called an accountability index score, from 0 to 100. This year, each district was also given an overall score. The scores evaluate not only the effectiveness of the school district, but also hold schools accountable for ensuring students receive the education and skills necessary to be successful in a career or post-secondary institution. In addition, the school report card displays the school’s performance on three areas of student engagement, including state test participation rates in reading and mathematics, absenteeism and dropout rates. Based on performance in the above areas, schools are given one of five ratings—from Significantly Exceeds Expectations to Fails to Meet Expectations. 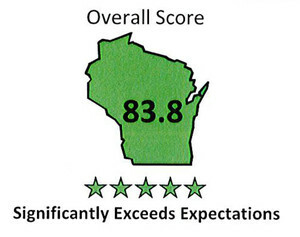 CWASD received an overall district score of 83.8, Significantly Exceeding Expectations according to the scorecard. CW’s rating places the district at #22 of 366 (or in the top 7% ) of K4 - 12 school districts in the state. CWHS received the highest score of the three schools with a 84.5, also Significantly Exceeding Expectations; Chetek-Weyerhaeuser Middle School scored an impressive 78.3 and Roselawn scored a 79.5, both Exceeding Expectations. The overall district score is the highest of the Heart O’ North schools and in Barron County. In addition, the district report card score ranks CWASD second in comparison with other regional school districts in the CESA 10 and 11 consortiums, only behind Osceola. "We are truly impressed with the work our students, staff and school families did to attain such high ratings,” notes District Administrator Mark Johnson. “CWASD has a very talented and dedicated staff who make it their mission each day to support the overall growth of our students. This is evidenced by such high performance on our state report cards. It is gratifying to see that the report card scores reflect the hard work that goes on each day in our classrooms and schools across the district. As a district, our staff has worked extremely hard to implement research-based practices that move us closer to ensuring all students learn at high levels. " Johnson also notes how exciting it is to see the hard work of students and staff be recognized. For additional information regarding the schools’ report cards, visit the DPI website.